Integrate leading social media services to help your organization learn from and engage with your customers at a more holistic level. Improve online collaboration and leverage social business application to increase productivity of your customer facing users. Access different Social CRM solutions directly within Sugar. The Twitter dashlet allows users to view and access various feeds for specific twitter accounts via the record’s Dashboard and list view's Dashboard. In addition, users can also view and access twitter feeds via Sugar's Activity Streams as well as the Twitter dashlet on Sugar Dashboard. Use popular email and calendar plugins for Outlook, Google, Lotus to archive emails, contacts, tasks, meetings into Sugar. 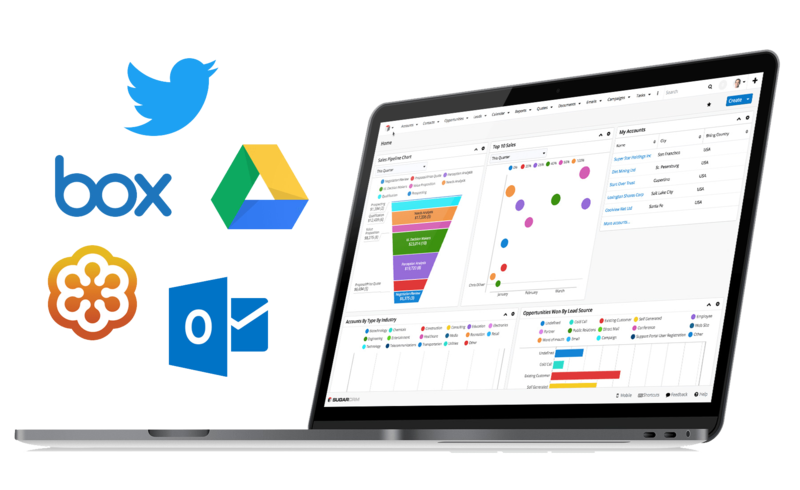 You can also choose from a variety of SugarExchange Extensions for online collaboration, cloud storage and social CRM built by SugarCRM partners. Schedule, start or join LotusLive, Cisco WebEx or Citrix GoToMeeting online meetings directly from Sugar. Associate customer-relevant documents to any record in Sugar and store them in the cloud. Get account and contact data using the Sugar Cloud Connectors. secure, Leverage cloud-based tools for social collaboration between co-workers, customers, prospects and partners. Use Sugar Studio, Cloud Connectors and Module Builder to easily add additional Social CRM capabilities.